KEEP EVEN YOUR LITTLEST PATIENTS SAFE AND SECURE. Protecting newborn patients from the threat of abduction has become a high priority in all well run hospitals and birthing centers. 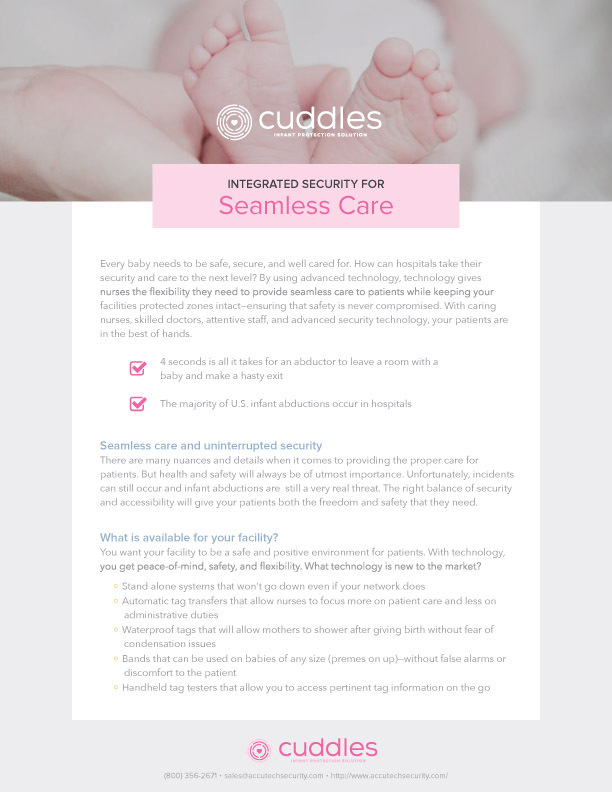 Providing high quality infant protection in a hospital environment is easier and more affordable than ever with Cuddles Infant Protection system from Accutech. "It's simple to use and whenever we need support, Accutech is prompt and helpful. Parents have loved that the bands are soft and don't irritate their infant’s skin. We plan on installing the Cuddles system in all new facilities." "I like the Cuddles soft band/tag being on the infant’s ankle instead of tugging on their navel cord (like other systems). Parents report issues with umbilical tags when changing the diaper and are always concerned about the device tugging on the navel. The Cuddles tag/soft band are out of site and mind. This system promptly works and has gone off every time we had an infant too close to the exits." "The system is user-friendly and our nurses feel the soft bands on the leg do not cut the baby (like other systems). They alarm quickly if removed and Accutech representatives assist as needed and provide additional training upon request." "I prefer the Cuddles infant protection system over our previous security system for several reasons. Cuddles is more accurate in regard to the infant location and the problem that needs to be addressed. 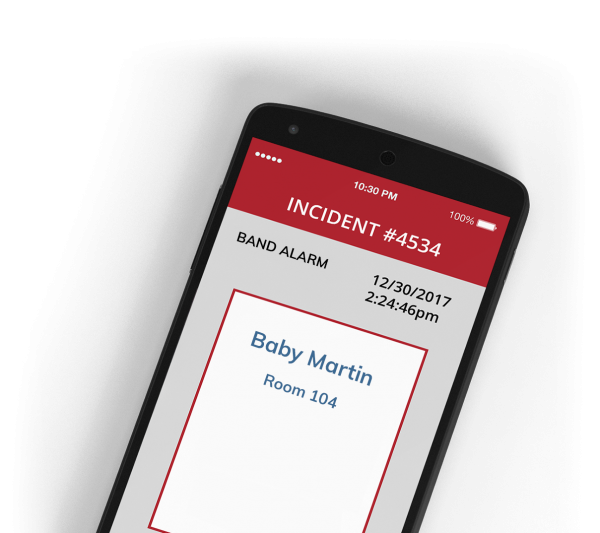 It alerts you to a band alarm, band removal, infant removed from the unit and low tag battery. The guessing is no longer there as to what the problem may be. Thanks for the great system and support!" "Our staff loves the ease of discharging and adding babies. We don't have nuisance alarms and our safety factor has increased greatly. Service is always easy to access and responsive." "One of the key factors to us was a local source for support and maintenance. We aren't dependent on technicians having to fly in or support it remotely. They can be on-site quickly if we need them." 4 seconds is all it takes for an abductor to leave a room with a baby and make a hasty exit. The majority of U.S. infant abductions occur in hospitals. SEARCHING FOR AN INFANT PROTECTION SYSTEM? Not all infant protection systems are created equal. 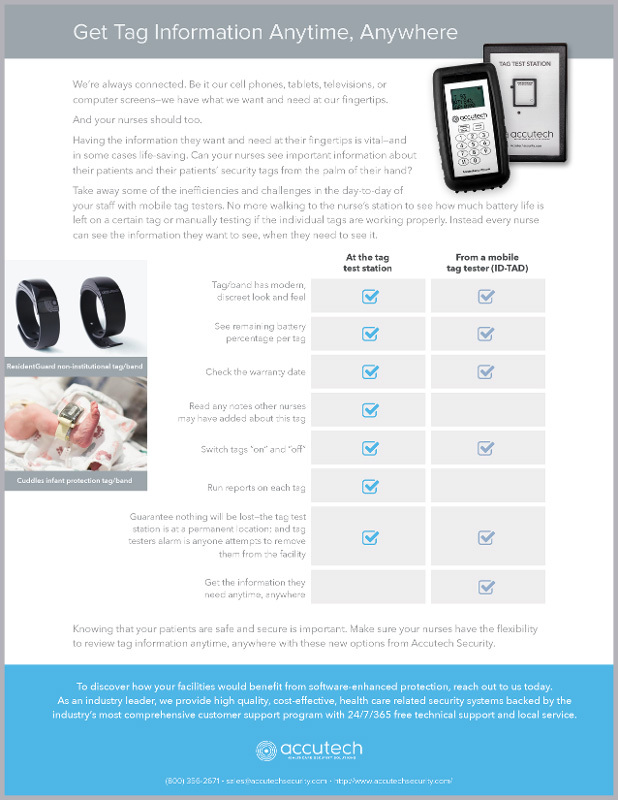 The tag test station gives current and future users the ability to see the remaining battery life and warranty date on infant and mother tags. The tag test station also allows users to see the tag program number, exact battery percentage remaining and allows nurses’ to record tag notes. The ID-TAD (Identification-Tag Activator/Deactivator) is a handheld device that brings additional functionality to the Cuddles system. Nurses can turn tags on/off, verify tag numbers, review warranty dates and check remaining battery life from the LCD screen. When coupled with mother tags, the ID-TAD brings mother/baby matching technology to the Cuddles infant protection system. All Cuddles systems are shielded against RF interference for the life of the system. Each tag operates at a unique frequency (418 MHz) on the edge of a range available only to the Department of Defense. The embedded ID code on the RF chip in addition to the unusual frequency it is transmitted on combine to make Cuddles the most reliable infant protection system available – minimizing the problem of false alarms (and alarm fatigue). The Cuddles infant protection system Soft Bracelet is a light-weight, self-adjusting band that fits snugly and comfortably around the ankle. Made of an ultra-soft polyester blend, the bracelet won’t cut or chafe the skin, and won’t fall off due to movement or changes in weight. Our easy-to-use Cuddles infant protection system software enables you to admit and discharge babies and generate reports more simply and quickly than ever before. No enrollment is necessary for instant protection, and on-site staff training can be completed in minutes. There's only six different alarm types in the software. 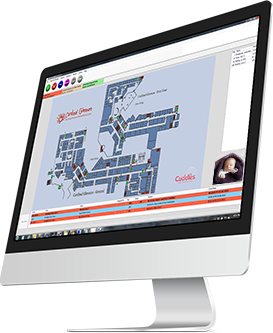 Multi-floor monitoring, event escalation and auto transfer capabilities are available, and the software can be updated for free to ensure that you're always operating with the latest features and benefits. Cuddles systems can be seamlessly integrated with wired & wireless nurse call systems. The system can also be integrated to paging, access control and CCTV systems. No More "Too Loose" Alarms! Experience the Cuddles light-weight, self-adjusting band that fits snugly and comfortably around the baby’s ankle. Made of an ultra-soft polyester blend, the bracelet won’t cut or chafe the skin, and won’t fall off due to movement or changes in weight. The tag will never come in contact with the baby’s skin. What happens if the bracelet is cut or removed? If this were to occur, the soft bracelet immediately activates an alarm—preventing abductions and ensuring the continued safety and security of the infant wearing it. Only 6 alarm types and FREE upgrades for the life of your system. If your computer goes down, our system is still hard at work. Out easy to use software only has six alarm types and enables you to activate tags, admit and discharge patients and generate reports more simply and quickly than ever before. Multi-floor monitoring and auto-transfer capabilities are available. Rest assured you always have the newest version of our software with free upgrades and no maintenance agreements required. Infant security is a paramount concern for maternity wards, and baby identification is a critical part of keeping newborns safe. Footprints from birth are a recognized and viable way to uniquely identify each baby. CertaScan by Accutech is the leading provider of digital footprinting, allowing hospitals to identify infants from time of birth. 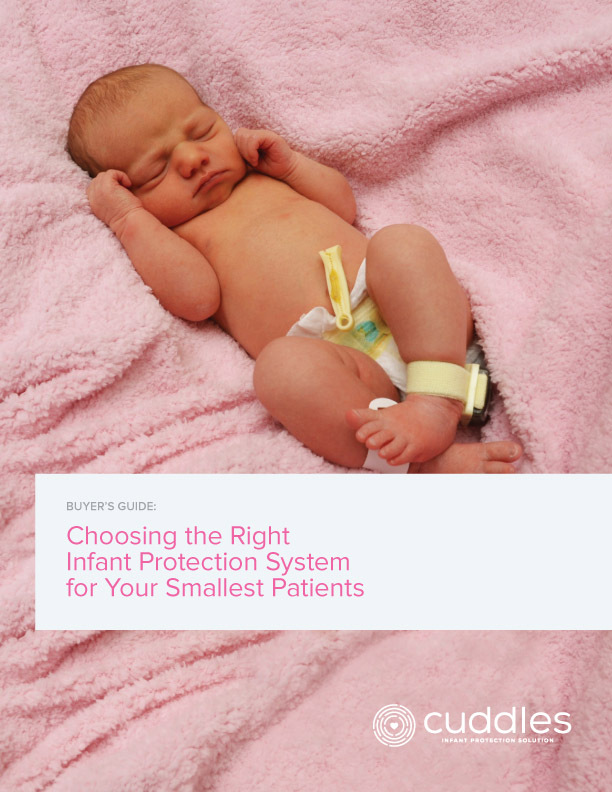 HOW DO OTHER INFANT PROTECTION VENDORS COMPARE? We're always connecting and have what we want and need at our fingertips-and your nurses should too.